Dubai Municipality is a prestigious employer and offers a wide range of jobs at all levels from new entrants to the job market to highly experienced employees. 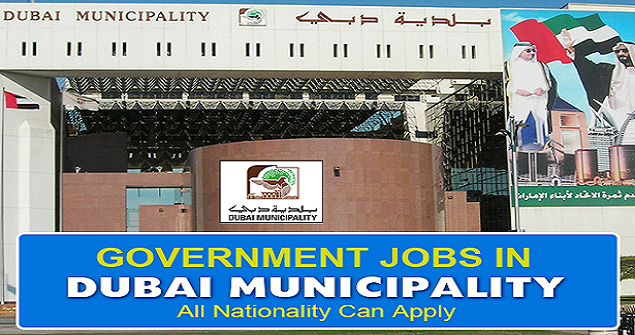 The best place to begin your search for government job vacancies in Dubai Municipality is on the Municipality's own website. Their career page lists all current vacancies in all departments and is a great place to start looking for a role to best suits your skills and experience. Government job vacancies in Dubai Municipality are also listed on some external third party websites which list general vacancies including sites such as WeJobz.com, CareerJet, Indeed and ThisJob. There are many benefits to working for Dubai Municipality. Employees receive a number of excellent perks including comprehensive employee health insurance for themselves and their family including their parents at a comprehensive network of health providers nationwide. This also stretches to insured dental treatment. Employees and their families can also enjoy annual travel tickets provided by the Municipality. The Dubai Municipality also offers a Motivation and Appreciation program to motivate employees as well as scholarship opportunities in order to complete academic programs. Housing allowances are also available to some employees as are pensions. However not all of these benefits are available to every employee and the perks which are available will depend on the employee's position and rank within the Municipality's organization. Depending on the role that you are applying for, you will require different types of qualifications and a different level of experience. For some roles, all that may be required is a good level of high school education whereas for more senior positions you will need to have a degree in a relevant discipline as well as several years of experience in a similar field. For roles that have contact with the public it is very important to have an excellent level of customer service and interpersonal skills and communication skills are always very important with strong English and Arabic language skills being very important. If you want to apply for government job vacancies in Dubai Municipality you can send your application via the Dubai Employment Service page on the Municipality website. You simply complete the application form which can be found on the website and attach copies of your educational certificates as well as any certificates relating to your experience. Once you have submitted your application you will receive a unique application number and you can use this number to follow up on the progress of your application. The recruitment department at the Municipality will review the application and if it meets the criteria for the position that you have applied for you will be contacted and invited to interview.